Connecticut is a member of the International Registration Plan (IRP). Connecticut registered motor vehicles that travel to another IRP jurisdiction (US states and Canadian provinces), and which have a gross weight or combined gross weight in excess of 26,000 pounds or three or more axles on the power unit, must either be registered in the IRP or obtain a special trip permits whenever the vehicle leaves the borders of Connecticut. Qualified motor vehicles from another IRP jurisdiction must have Connecticut on the cab card or have a valid Connecticut IRP trip permit prior to entering Connecticut. If you do not have Apportioned plates, but need to cross the Connecticut border with either a multi-axled vehicle or a vehicle (or combination) over 26,000 pounds, you must obtain a Trip Permit for any jurisdiction you travel in. If you have Apportioned plates but you want to cross into a jurisdiction not listed on your cabcard, you must obtain a Trip Permit for that jurisdiction, or else obtain a new cabcard from the IRP Section with that jurisdiction listed. city pick-up and delivery vehicles and recreational vehicles. The International Fuel Tax Agreement (IFTA) is an agreement between all 48 contiguous states, and 10 Canadian provinces. It enables participating jurisdictions to cooperate in the collection and administration of motor fuel taxes. An IFTA account is set up with the base state, which authorizes travel in all IFTA jurisdictions. Then a single quarterly report must be filed with the base state, reporting miles traveled and fuel purchased in each state. The base state is responsible for dispersing the funds to the other jurisdictions. OR has three or more axles, regardless of weight. 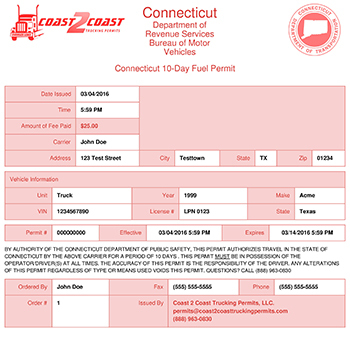 If your vehicle qualifies and it is not currently registered with IFTA, you must obtain a temporary fuel permit to travel in and out of Connecticut.